I've listened to the Karajan on EMI and the fiddling with the knobs and odd balances ruin it for me. I like Knappy and it gets great reviews. Definitely recommended, despite crummy sound. Kna doesn't disappoint, and Treptow was a nice surprise, as I'd read only negatives about him. We should have him around today. I love Die Walküre and Götterdämmerung, but Tristan's an ordeal. Yeah, if they were the only four I had I would be well satisfied. Bohm 1966 - live - I find Nilsson, despite some terrific singing, wanting in human emotion. Windgassen is over-parted but most tenors are. Kleiber - worth hearing for Price and Kleiber. Sadly Kollo sounds past it and so does D F-D in spades. Decca missed the chance when they recorded Tristan with Solti when they had Karajan under contract. Culshaw and Karajan working together at that point might have produced something memorable, despite the journeyman Tristan. As it was Solti (as he admits in his autobiography) was too inexperienced and the result was an over-driven recording with not very imaginative singing. Karajan of course was annoyed that his orchestra was recording an opera that was one of his specialities and set about sabotaging the recording by demanding (and getting) sessions of his own that caused the whole Tristan set to be dismantled and reassembled every day. Not the brightest of Culshaw's decisions as a recording producer even though the Tristan sold well at the time. Technically speaking, most performances of Tristan last about as long as Die Walküre or Siegfried, and the longer ones about the length of Götterdämmerung. Yet I think I can understand why there are those that struggle with it -- in a way, almost the whole opera operates on a similar level to Wotan's monologue in the Die Walküre: it's both a narration of backstory and carrying us into the character's state of mind, revealing their needs, desires and innermost turmoil. I'd be curious to know if those who view Wotan's monologue as one big longueur are also the ones who tend to find Tristan und Isolde rather tedious. Me as well, but I still think Martha Mödl's Isolde for Karajan in 1952 is essential listening for any lover of this opera. Last edited by Faustian; Oct-20-2017 at 16:17. Kleiber DG: Surprisingly fine cast, with M. Price and B. Fassbaender as the highlights, while Kollo and late Fischer-Dieskau impress me too. Böhm: brisk and detailed orchestral sound of the Bayreuther Festspiele; it's very fine (except Ludwig's Bragäne, never of my taste) in all singers. Same vibes as the 62 Lohengrin. Bernstein: I appreciate this more than Böhm because there is a sense of discovery. Most fascinating orchestral playing over Karajan with highlight in Act III. If only the cast was better. Behrens and Minton are quite lightweight and can defend themselves, what I cannot bear with is the male cast led by a burnt Hofmann. I would swear by listening to Solti's recording that Wagner was experimenting with atonality in Act I, but his overall interpretation as well as the singers, is quite all over the place. But with some shots of Kleiber and Böhm, I can know what this opera is about. For this I have two references of TUIs: the aesthetic and the anguished. Both are excellent and almost unbeatable by mono recordings. Just thumbs down again for Christa Ludwig. I cannot enjoy her in that role. Karajan, the BPO, Dernesch and Vickers (Act III) are unbeatable, only on par with the Barenboim recording. I really liked Dernesch's voice from the beginning, but not Vickers. Act III with a soulful Berry as Kurwenal and the own Vickers were enough to mesmerize me. With this interpretation, this opera cannot be more "beautiful". I seriously have an issue with this staggering version. Do never recommend this to people with heart condition. The Barenboim BPO orchestration can leave you breathless with the constant intensity and the superpowers of Jerusalem, Meier and Salminen can also contribute to give you a headache. High tension everywhere. Jerusalem's Tristan is surprisingly lyrical (where was he in his Lohengrin?). Meier is a highly drama-queen Isolde. Salminen conveys pain as Marke and Struckmann's Kurwenal improves when joined by the orchestra in Act III. The soloists are as superb as in Tannhäuser, but it's again about to give me a heart attack. I always hoped that I could reccomend this "modern" recording to people, but I'm afraid I cannot do so because this might put their health in peril. I did say I wasn't interested in adding anything new, but have since added the Bernstein, which I saw at a good price in original packaging. Now I just have to find time to listen to it. Not so easy! You make interesting points. For Kleiber I find D F-D awful - right over the hill vocally. Kollo thin of voice. With Solti Culshaw tried out a sonic stage system which didn't work. Solti would liked to have recorded it again. They should have got Karajan in to conduct. 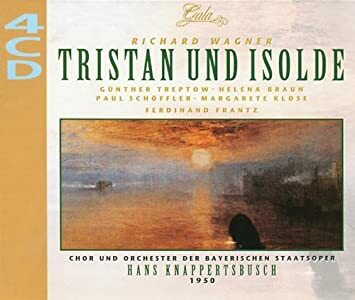 Listening to many many Tristans this week, and I keep coming back to the 52 Furtwangler in Pristine XR remaster as my reference, if I could only have one this is it. The clarified sound beautifully highlights what an amazing Isolde Flagstadt was, her voice here reveals color and nuance expertly applied to each scence, wonderfully in harmony with the orchestral themes never strained or harsh.......natural and effortless rendering of each scence. I do prefer Flagstadt here to Nilsson who will soon after dominate the role on stage and in recording studio, although Birgit's voice is powerful and clear for me she does not have the shading, depth and color Kirsten has, I here more character and artistically used tonal variation the enlightens each scence with Kirsten, I find her fascinating and exotic with a new twist around each corner, Pristine XR really amplifies this.......Nilsson can become a bit too predictable and almost tiring for me. Last edited by DarkAngel; Dec-03-2017 at 04:54. If you like Suthaus' Tristan, as I do, you should seek out a couple of other recordings. There's a complete recording with Konwitschny from 1950 that finds him in somewhat fresher voice, but the rest of the cast is mostly disappointing (with the notable exception of Gottlob Frick as Marke). This was issued by Preiser, but is now OOP. Unfortunately, it's only Act 2 and 3, but both Suthaus and Furtwangler are fantastic here, both better than on the commercial recording.